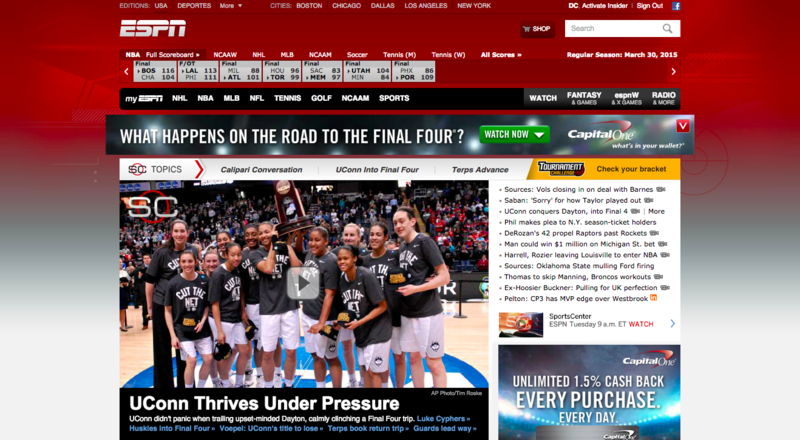 ESPN is rolling out a completely redesigned site in time for its 20th anniversary. For a website with up to 2.3 million visits per hour, this is a big deal. The former site, in web years, is vintage at six years old. The new one is responsive (it looks good on your phone or tablet), friendlier, socially adept, and otherwise not old as hell. Here’s how the redesigned site looks on an iPad. Before we proceed, I should give the former ESPN.com its due. The site’s actually aged well despite our jabs (sorry to our buddies at ESPN). In fact, ESPN broke traffic records this January with ESPN.com Classic. The old ESPN.com has apparently done so well that there’s “nothing that says we need to redesign the site,” the company’s product SVP Ryan Spoon told us yesterday. But ESPN believes a new focus on mobile, video, and shareable Material Design-esque content cards will push it over the edge. We recently explored the ins and outs of another major media company’s redesign: Bloomberg Business. But where Bloomberg’s new design is beautifully bizarre, led by the company’s jarring design sense, ESPN’s new site is a product of UX tests, data, and modern convention. Spoon’s team conducted thousands of on-site tests over the past year before arriving at the following results. Playing it safe wasn’t a bad call. Sure, I’d get a kick out of a riskier redesign, but for a site of ESPN’s size and success, tweaking a single button could weaken an exec’s knees — let alone remaking an entire site. For this, we’ll give ESPN a full pass. The redesign is bold enough. Fans are finally getting a fresh site that is far easier to use on any device. Great work, ESPN. Please do pass Go and collect $200.